Over the past couple of years I have had several frustrated clients bring their cats into the clinic because they began using the couch or some other piece of furniture as a litter box. I explain the importance of determining if their cat has an underlying medical condition or if this is a behavioral condition. 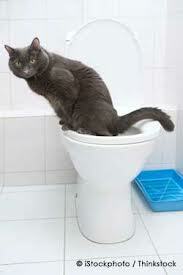 There are several different diseases that can cause a cat to go to the bathroom outside of the litter box. A few of the more common causes include urinary tract infections, cystitis (inflammation of the bladder) as a result of crystals or stones in the bladder, and kidney disease. With all of these conditions it may cause your cat to have small frequent accidents inside or out of the litter box, blood in the urine (hematuria), or painful for them to urinate. The most important aspect in determining the underlying cause of this ailment is to get a very detailed history of the cat. 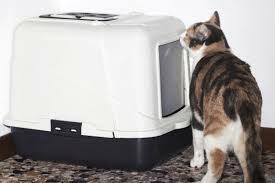 There have been several instances while talking to an owner that they report that cat starting urinating outside the litter box after they got another pet, or something as simple as moving the litter box to a new location. Next, performing a thorough physical exam, collecting lab work with a urine sample, and sometimes even x-rays help in determining if there inappropriate urination is a medical or behavioral condition. If one of these conditions is diagnosed then proper medical management and a possible change in diet will be done. If the previous medical conditions have been ruled out then it is most likely your cat’s misuse of the litter box is a behavioral issue. Cats have very unique personalities and sometimes the simplest things (like moving a piece of your furry pet’s favorite furniture) can cause them to be upset and urinate somewhere outside the litter box. Identifying if any changes within the house or a stressful situation that your cat may be experiencing are needed to help try to correct the problem. 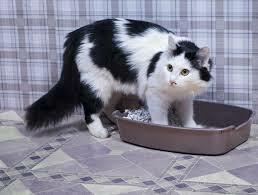 Here are a few tips that can help to make sure your cat uses his or her litter box. 1. Always make sure that the litter box is cleaned out; ideally the litter box should be scooped out daily and washed with soap and water weekly. 2. Make sure you have plenty of litter boxes; a good general rule to follow is 1 litter box per cat in the house plus 1 extra (if you have 2 cats then you should have 3 litter boxes). Sometimes it’s the type of litter box that they do not like or the type of litter. 3. If there are multiple cats in the house try to place the litter boxes in different, quiet areas throughout the house. Some cats will become defensive of their litter box and not let the other cats near them. Once these changes have been made and your cat is still having accidents medication may be needed. In some cases anti-anxiety or stress medications are given to help comfort and calm your cat. There is also an all-natural product called Composure that may help in these situations. This product contains natural ingredients like Tryptophan, Colostrum, and Vitamin B1. It can be given daily in your cat’s water to help relieve their anxieties and prevent them from inappropriate urination. We have had great success with this all-natural product, but only after ruling out a medical condition. Cats urinating outside of the litter box can be a very frustrating problem for owners, and often times plays a big role in cats getting turned over to the shelters. Please help prevent this from happening to your cat if you’re having this issue with your cat please call us and set up an appointment today! This entry was posted in Cats, Pet Health Concerns, Pets, Veterinary, Veterinary Medicine and tagged cats, cats and urination issues, Kittens litterbox training, litter box issues, veterinary issues. Having practiced Veterinary Medicine for 36 years you can bet that I have seen just about every imaginable disease and injury in just about every species of animal. So I am often asked; “what is the most common disease that you see”? Or “what is the deadliest ailment that you encounter in daily practice”? People expect me to say something like cancer, trauma, or infections. But sadly enough the deadliest disease is also the most common disease that I see. It is an epidemic. Depending on what study you read it affects 35 – 60% of our pets in this country. This disease is the number one reason why animals are presented to veterinarians for euthanasia prior to what their life expectancy should have been. There is plenty of research to prove beyond doubt that this disease will take a least two years off the life of an animal. That is a bunch when you consider that they may only live 12 – 15 years under the most ideal circumstances. Two years is a 15 – 20% reduction in life span. That would be like us losing 10 – 15 years of our life. I don’t know about you but I am not interested in giving up that much of my life if I can do something to avoid it. Furthermore this disease steals away so much quality of life! They not only die too soon they are miserable for years before they pass! Their life simply is very unpleasant because they are plagued with so many other terrible diseases which are brought on by the preventable initial one. Well the short list includes arthritis (often so severe that they become immobile! ), joint degeneration, skin, liver, kidney, and heart/lung disease. A significant reduction in energy resulting in less play and socializing is very obvious. And if we are talking about cats they are at high risk for developing diabetes! This is a horrible disease for people who if they choose can control not only their insulin but every other aspect of their life including sleep, exercise, diet, and life style. In animals we only have total control over the dose of insulin everything else is variable and because of that regulating the diabetic pet can be quite difficult. So what is the “Deadliest Disease”? The cause is simple. Taking in to many calories causes obesity. PERIOD! Other causes are extremely rare! Over feeding and too many treats is the culprit. You have total control over this. 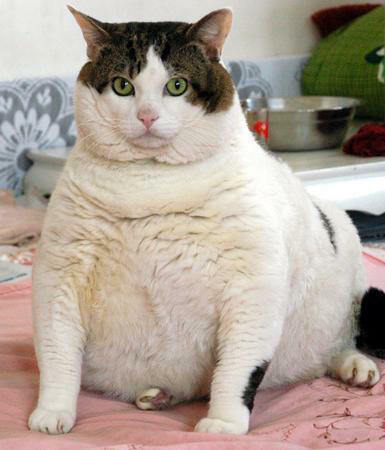 Do not let your pet become over weight and if it is; consult us about nutritional requirements and dieting. Dieting is no fun. I hate it myself! But it is the only way to lose weight. It is much more logical not to allow them to gain the weight in the first place. But if they are already too heavy then a diet is the only way out. So I said that obesity is simply eating too much and it is. So feed measure portions to your cats. Do not allow them to graze at the food bowl 24/7. The average cat only needs about 150-180 calories daily. Go easy on the treats! If your cat needs 150 calories daily and you give 5 treats that have 10 calories each you just blew the diet by giving 33% more calories than required! Remember this! Obesity is not a cosmetic problem. It is the most widespread deadly disease that I deal with! This entry was posted in Cats, Dogs, Pet Health Concerns, Pets, Veterinary, Veterinary Medicine and tagged cats, obesiety in cats, pet diabetes.